Whether you're a master fish keeper or have just set up your first tank, the API Saltwater Master Kit contains everything you need to ensure a healthy environment for your aquatic pets. 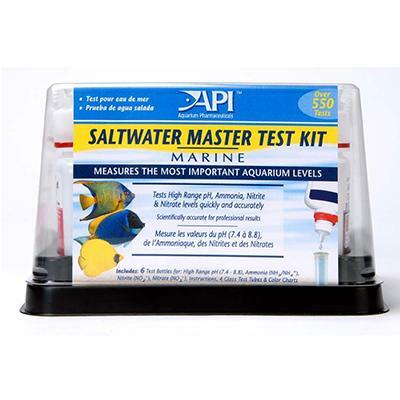 Test for all the important parameters whether you're keeping damsels or Lionfish. Includes High Range pH, Ammonia, Nitrite, and Nitrate. Over 550 total tests, makes a great gift for the beginner and professional alike. Kit includes all reagents, 4 test tubes, computer calibrated test result cards, holding tray with clear cover, and step by step instructions. Complete testing instructions can be found here.